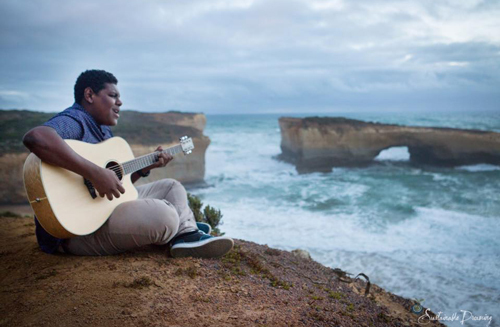 Self taught, guitar virtuoso, young Chris Tamwoy from the Torres Strait Islands, has been making waves in the music industry recently. We're proud to support him via management & promotions, including a new website - www.christamwoy.com. Coming very soon - his first EP, supported by Sustainable Dreaming & signed to Impossible Odds Records! To support one of our talented, inspiring Dreamers, 'Weva Deva', weaver, teacher, and fibre artist Anaheke Metua we've created a set of 3 beautiful cards to show off her diverse work. We're proud to have been able to secure funding, help organise and document the Quandamooka Culture Tracks project on Minjerribah, North Stradbroke Island. This was a 10-day cultural exchange between Quandamooka people, local residents, visiting artists from the Solomon Islands, Vanuatu, Tonga and Cook Islands. It included teaching and learning Traditional songs, dance, language, sharing stories, food, local cultural tours and more. It culminated in a combined performance at the annual Island Vibe Festival. Special thanks to Leweton Cultural Experience. More pics on our facebook page, and videos to come in 2015.
are currently featuring some of our films, including Chuulungan Media films and Frank Ansell's short peices. 'Aunty Joan' goes to air as part of NITV's "Our Stories, Our Way, Everyday" series. Thankyou Aunty Joan Hendriks, Joe Stewart, local community and all who helped out. Lukaotem Gud Santo Festival, Fest Napuan, and the inaugural Singaout Musik Kamp are on in Espiritu Santo, and Efate Islands, Vanuatu. Our Dreamers will be there for a month for filming and media training and cultural immersion .